All our desserts are made daily by us, using nothing but pure wholesome ingredients! Pies are our specialty! …and everyone loves them. 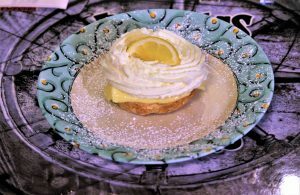 A house specialty, A smooth lemon custard fills our delicious light flaky crust, topped with a mound of whipped cream. This pie was voted BEST PIE IN SONOMA COUNTY! All of our pies are deep dish. Choose from Boysenberry, Tripple-Berry, Apple, Apricot, Peach, Cinnamon Pear, Raspberry-Peach, Rubarb, Raspberry Pear & many more. Our Raspberry -Peach won 1st place at our Sonoma County Fair! …WOW! All of our bakery products are made with cage free eggs. We only use dairy products with no growth hormones. We make a variety of sizes for our pies. Individual sizes, plus 7-inch and 9-inch. Our pies are perfect for parties. Remember us during your holiday events. On occasion we also have cream puffs and filled cupcakes. Ask your server for further information. Our Bakery items are all from scratch made by our baker using only local Clover Stornetta Dairy Products. Again cage free eggs, no growth hormones in any of the dairy items We love taking good care of our loyal subjects, you, the diner, here at Betty’s. Enjoy!